I spent much of my weekend as well as almost all of today doing my patriotic duty by evaluating stimulus package grants for the NIH. There was naturally a big influx of applications, and so many people, including myself, ended up on the other end of the grant evaluation process. I've written and consulted on plenty of grants, but I've never read strangers' proposals before, and I've certainly never taken the time to write a critique. I got through about 250 of the 300+ pages of grants I was supposed to evaluate before the midnight deadline. It was really educational reading, especially the not so good grants, some of which read like a checklist of what not to do. Still, it was one of the more tedious things I've done this year. At around hour seven I realized that I still had two grants left, one twice as long as the rest, so I made a pan of survival brownies from a box of Duncan Hines mix for sugar rush fuel. It's not my usual tarts made from scratch, but it's more than enough to keep me from giving up and taking a nap. Yesterday I trimmed my pork belly to make it more square and I was left with a large hunk of meat, that was about 80% fat. This was inspired by the the documentary Sandwiches That You Will Like which was saved to the DVR solely for its name. And, indeed, Clark and I were dying from the like of the sandwiches we saw on our screen. It's about an hour of watching people cook meat in dozens of different ways and then place them on countless types of bread. It's totally worth a viewing. I felt inspired to use my pork belly piece for something. After reading I learned that I would need to cook the meat for at least four hours. Sheesh! I found an awesome recipe for a pork belly sandwich that would be exactly what I was looking for, something flavorful and a little exotic. So I cooked and cooked and cooked and my whole house smelled like spices. I put my Braised meat in the fridge overnight because I was ready for bed by the time it was tender enough to use. The next day at lunch time I took out my meat and sliced it into little pieces. As, expected I ended up with about 80% of my cuts as pure fat. I tried a little piece of fat just to check. It tasted good, but I realized that I would probably die if I ate a whole sandwich of them. So, I switched to plan B; I had just enough meaty slices to serve as a pizza topping. I used my favorite olive oil flat-bread recipe for the crust. It was a happy accident that I switched to pizza because the taste of the meat is so strong that it should probably be limited to small quantities. Still, it's a mighty fine lunch. I've gone off the deep-end and decided to try my hand at the BLT from scratch Summertime Challenge. That means growing my own lettuce and tomatoes (check!) making my own mayo and bread (no problem!) and curing my own bacon (umm...). Wait, is that even possible at home without fancy equipment? Of course it is! I just need a little help from the New York Times. Two days ago I went to the butcher at Wholey's and bought my own pork belly, a cut called 'fresh side' oddly enough. Wouldn't a pork belly be a 'fresh bottom' or a 'fresh underneath'? It still has the skin attached, which is a little creepy, but I'm told it makes the best soup stock. According to the New York Times I just need to rub my pork with spices, let it cure in the fridge for a week and then dry it out further in the oven. I think I can do that. Okay, we are GO for bacon. I'll post what cooks up when the cure is done in a week or so. Okay, this is crazy...but a friend, a very convincing friend, talked me into attending Anthrocon this year. Yes, it's that Anthrocon, the annual furry convention. I had no idea that there was an annual convention, in my fair city of Pittsburgh no less, of people who like dressing up as and acting like animals. At first, I had absolutely no desire to go, but my friend convinced me over several months with stories about canine commandos and technicolor panther pimps. I am easy to wear down if you can tell a good story. So, now I'm resigned to going. And of course, as with any special event I had to make a new dress, one that will serve as my camouflage. 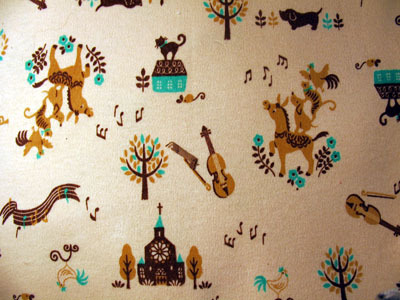 The fabric itself is covered with tiny frolicking animals. It was my intention to make this dress using a new pattern, but the test run didn't turn out too well. So, out of impatience I used a familiar adaptation of two patterns, S3835 from the neck to the armpits, and M5144 from there to the bottom hem. I also add darts in back to make the shape a little more fitted. I've now made this exact knit dress a total of four times, and this is the second one this year. Still, the pattern is really versatile and it's as comfy as wearing a pair of pajamas. I have weird, mixed feelings about picking flowers that go back to getting scolded for taking flowers from a neighbor's yard at the age of four. What? They were just sitting there in the open! On the one hand, flowers are pretty, and on the other hand, I might get yelled at for picking them! OMG! Even when picking wild flowers belonging to no one from the side of the road here I tend to wait until right before a big storm because the flowers are going to get destroyed, anyway. Please, don't yell at me. Still, I really like having little vases of flowers to look at. And when the flowers get a little tired I like pressing them because then I can keep them for-EVAH, and also because I am a hundred years old. Not all pressing flowers are created equal. The best ones have dry, almost woody stems like daisies, roses or lavender, or tiny, compact flowers like queen anne's lace or yarrow. Flowers with fleshy stems or really delicate petals don't work so well. Tropical flowers are also tough to press and dry; they almost always completely lose their color. My favorites come from mountain meadows. If you live anywhere near the Bear Tooth Mountains in Montana this is the ideal time of year to hit the fields above the tree line and pick some flowers that press beautifully and keep their color. The only equipment needed to press flowers is a fat, heavy book and several others to place on top. I like to clip the stems off of my flowers, but it's not required. I also like to place my flowers between a piece of paper to keep the pollen from staining my book. The book is going to absorb moisture from your cuttings, so it's better to only place a few on each page at a time and space the flower arrangements apart by a 50-100 pages or so. Pressing only takes a week. The flowers will be delicate and will lose their color if they get too much sunlight, but with the proper care they will last a lifetime. It's been about three years since I've actually translated anything from Japanese. I find it much easier to just read something without taking the time to write everything out, and lord knows I spent plenty of time doing that in college. Of course, this leaves me suspended at a reading level that can only handle crafting books and comic books, and I'm a little disappointed that I still have trouble reading the newspaper. Clark can just pick up a copy of the Asahi and flip through casually, while I'll spend 20 minutes frowning over a two column article. Still, translating something, even something withing my comfort level is good brain exercise. I also learned that I've been reading a few words completely wrong for years, namely the word for 'topstitch', which I'd been mistaking as a synonym for just 'stitch'. Oh well, reading is fun, y'all! My, my those are some mighty fine diagrams. 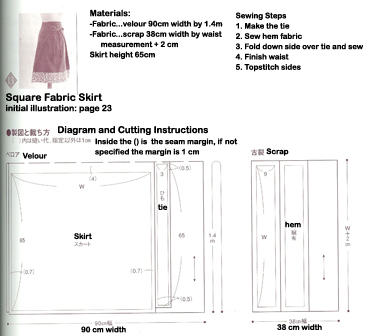 The pattern is from this book, 直線縫いでざくざくできるスカート, which I highly recommend to anyone interested in making their own skirts. I've been wanting this book for months, mostly for the pattern above, and some friends were kind enough to bring back a copy for me last week. Now I have the whole thing and not just a few thumbnails online, oh and there are sooo many good skirts, ones that I would never have dreamed up on my own. Japanese craft books are the best! 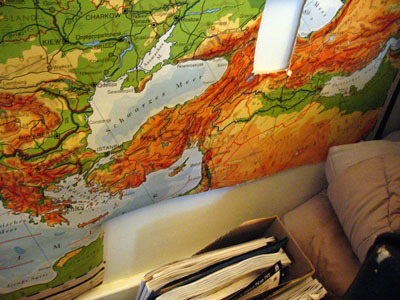 I bought a map from some friends a few years ago. 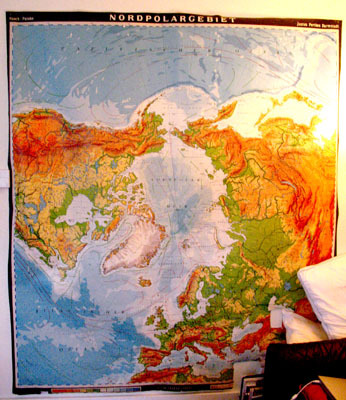 It's a polar projection of the Northern Hemisphere, and it's in German. I have it hanging in my living room and look at it every day. However, there are some weird things on the map that make it hard to pinpoint when it was made. The friends who owned it previously got it from a classroom building that was set for demolition at their university about five or six years ago. To make the map conform to their bachelor pad they cut holes for an outlet and a heating vent, eliminating most of the map key and any publish date information. 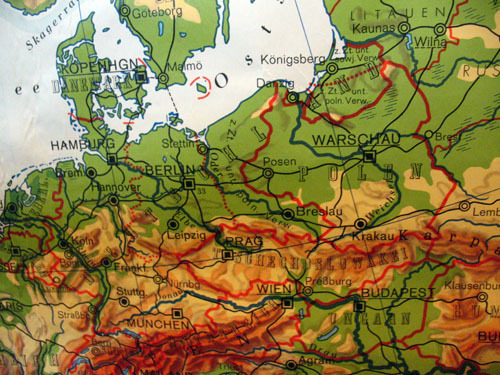 Still, there is some weirdness to the map, for example, the borders of Poland and Germany. Was that the border when the map was printed, or is it just indicating new borders ...or is it just wishful thinking on behalf of the German publishers? This is the latest date I can find on the map. 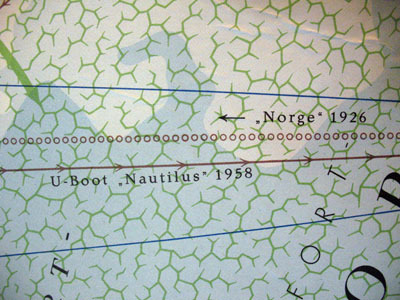 It shows the 1958 journey of the USS Nautilus under the ice at the North Pole. I've put up a Flickr set here. It has a few additional pictures. I would be happy to add more if anyone were interested finding other clues, so leave a comment if you have any suggestions. I'm thinking that looking at city populations might give some clues, but I'm missing most of the key and I don't know where to start. My house smells like bacon. Jealous? I've been living off of the contents of our cupboards and whatever is ripe in the garden for the last two weeks. If I can make it to Friday without grocery shopping we'll have enough money left in the budget to go out to eat. We've made some budget cutbacks and I'm getting sick of my own cooking. 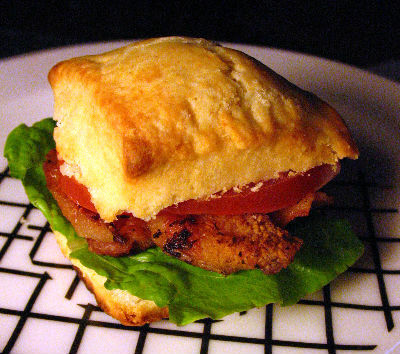 However, I will never tire of BLTs or biscuits. I'm a Southern Girl, so biscuits are my kryptonite; I am weak against their buttery goodness. Everyone in the south, it seems, has a grandma that makes awesome biscuits. I have no sunbelt-dwelling, biscuit-making grannies of my own, but I managed to live off of the largess of other peoples' Meemaw biscuits. Still, I have no recipe that I am beholden to, so I tend to try a new one each time. Recently, I heard about whipping cream as the magic ingredient for making those perfect dense, cakey biscuits. I tried this recipe to make the sweet cream biscuits. Holy crap, these are so good! The bottoms burn easily, so I need to figure out some strategies to fix that. Still, best dinner ever! I have lots of paper samples, cutouts and photographs up on display in my house, ready to be used in whatever project I'm working on. It's the same as my refrigerator philosophy: anything that's out of view is unlikely to get used. However, because I am picky and obsessive, anything that would mar my precious ephemera is not an option. That means no tacks and no tape. Instead, I use magnet boards to keep everything organized and in view. It's easier to take things down and put them back than with clips or wall putty and one strong magnet can be used to hold way more than one thing at a time. The key to building magnet boards is to buy a big, fat roll of galvanized steel roof flashing. It's sold in most home improvement stores in the roofing section. Most places stock the aluminum stuff as well as the galvanized steel type, so check before buying because while aluminum is useful, it's not magnetic. You'll end up with about ten feet or more for $10. It sounds like a lot, but it is a material with many uses. Building the magnet board is really simple. I like to use broken down frames that I get at yard sales. Ones with missing or cracked glass are perfect. Just take the back of the frame and trace its outline on to your piece of flashing. Then, use tin snips to cut out your piece. The edges can be sharp, so be careful. Slide your piece of metal into the frame the same way you would a pieces of glass, trimming if it doesn't fit at first. I use these a bunch around the house. I have one with a really fancy frame. I also, have a wall-length one in my office that's been up since the first month I moved into my house. Many sewists call test runs of patterns 'muslins' after the cheap, undyed cotton fabric used traditionally to make and test patterns. I'm usually terrible about testing out patterns with inexpensive fabric before trying with the pricey stuff. Most of the time it's that I don't have time to make two of something. I just want one that is the right color, the right fabric and fits. Usually, I get lucky and the finished product fits with only minor alterations. However, there are some fabrics that are too dear and some patterns that are too untrustworthy. I think my instincts were correct and I saved myself some frustration and heartbreak by trying out NL 6813 before cutting into my nice, cute fabric. Since this pattern calls for knits, I sacrificed some of my leftover green cotton interlock instead. Sigh. This pattern won't work for me without some major alterations. The sleeves are too loose and the cut around the waist is way too baggy. I could alter to fix these flaws, but there is something about the cut that is not cute. I really want a t-shirt pattern that can be converted to a dress and have a contrasting collar. I guess it's back to scratch, then. When I was growing up I was the only person in my family who could stand to eat pickles. Whenever we would have fast food burgers I would always end up with a little pile of pickle slices that my parents and brother scraped off of their buns. I ate them between bites of chicken nuggets and savored the contrast of sourness to the taste of the sweet nugget dipping sauce. Man, I love pickles. Today, I am married to a fellow pickle lover and we have no less than four jars of pickles in our refrigerator. Of course that won't stop me from making my own. We have five cucumber plants in the garden spanning three varieties, so I should start strategizing how to use as many as possible before I start harvesting a dozens a week. However, I don't have the patience or skills yet to do large scale, long-term cucumber pickling. What I do have is the experience to do is make quick, Japanese-style pickles. They don't keep more than a week in the fridge, but one won't have to wait two months before having the first bite. Plus, the unique savory taste, in addition to the usual salty-sour flavors, will guarantee that these pickles won't last more than a day or two. Coat the cucumber slices in a light layer of sea salt. Place them in a bowl and add just enough vinegar to cover. Add in the katsuo and cover the surface lightly with dried wakame. Don't stir. These last two ingredients will give the mixture a dose of umami that makes this recipe special. Let the cucumbers sit for about four hours at room temperature. I cover mine with a screen to keep varmints away. After a while the kelp will rehydrate. You'll be able to eat it, too, if you like. I prefer my lightly pickled kelp served over a hot, steamy bowl of rice. This recipe makes strong, flavorful pickles so watch out! I love egg beaters in general. I'm fascinated by the old-timey hand cranks and interlocking gears. There aren't many kitchen tools that are so mechanical, yet don't need to be plugged in. I got this set of egg beaters for $1 from a yard sale last week. I was planning on taking them apart and making a hand crank bobbin winder, but the spinning beaters on this set are different from what you usually find. The center of the beaters is a thick, stationary wire and only the surrounding blades turn. I'd want that center part to rotate in order to do the winding, so this pair isn't going to work for my original idea. I have a few thoughts about how I might repurpose this tool, but none that are especially good. Do you have any ideas? Drop me a comment if you have something you'd like to share. The stormy weather today gave us some extra cooking challenges today. We made dinner for six people, but due to the biblical weather conditions the power died during our prep and cooking time, and we remained without electricity for about an hour. Oh, and four inches of rain we got over the course of three hours caused the basement to flood. So I was down there holding a flash light an moving boxes and laundry to higher ground while Clark cooked upstairs by candlelight. Flippin' fabulous! I vote that our next house should be on stilts. 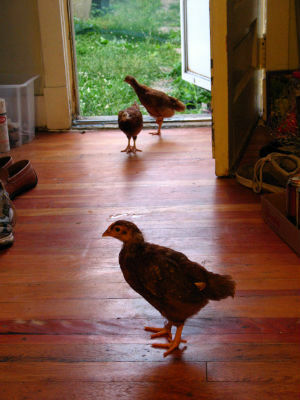 It was also too dangerous for the animals to remain in the yard, so we ran outside and brought our soaked, scared birds indoors. The chickens were happy to have a chance to get warm, but the ducks are always indignant about being handled and confined. "Quack! Quack! How dare you touch our royal personages! Quack! We shall have you peasants flogged! Bring us more broccoli! Quack!" Luckily, we have plenty of emergency candles, a gas stove and a sense of adventure. I chose this crazy day to make my first sponge cake, ever, though I did make that decision before the power went out. Still, even with the power on I tried to make the cake as much by hand as possible, beating the egg yolks and the egg whites by hand. Actually, I only lasted through a total of ten minutes of vigorous hand beating before resorting to electromechanical help. My biceps were KILLING me. I need to get in better shape so I'll be ready to hand whip egg whites into meringue before the end of summer. Whee! I used this recipe from tasteofcuba.com. I've eaten a lot of piece of tres leches, it's a popular cuban dessert, but I've never even seen someone else make it, let alone tried on my own. 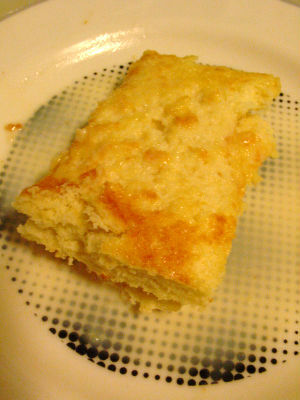 The cake base is a sponge cake drizzled in a mixture of evaporated milk, sweetened condensed milk, and whipping cream, hence the 'tres leches'. The recipe also calls to top the cake with meringue, but I decided that was a little too much sugar for me, plus I was a little tired of whipping egg whites. Cakes should only take so much work before they're not worth it. I was surprised, but the sponge cake came out with the right fluffiness and texture. The only problem was that I had a little trouble flipping it out of the pan for the drizzling step. It was pretty stuck in there, so I lost some chunks. Still, between six people we managed to eat 3/4 of the total. Yippie! About two years ago, some of my friends posed for pictures in front of a green screen so I could add their silhouettes to lanterns for my wedding. I've had the paper cutouts of each silhouette sitting around doing nothing since then, so I decided that it was finally time to put them to use again, this time to make plate decorations. I started out by positioning a silhouette on the plate. This one has a little water damage, so I'll be filling in the missing bits on the leg. Next, I traced a pencil outline of the cutout. And then I traced that line using a ceramic marker. Finally, I filled in the shape. Let each plate cure for 24 hours and then baked to set the glaze according to the directions on the marker. Oh man, I think mango sticky rice is once of my favorite deserts. I love its simplicity and how the flavors blend together. I've been waiting for good, ripe summer mangoes to arrive so I would finally have a fruit to do this dish justice. The fruits are the big ones with a little bit of squish to them. I'm thinking about making this dish another time when we don't have dinner guests, because even though this recipe serves four I want it all for myself. MINE! Cook the rice according to directions. A few minutes before the rice is done put the coconut milk in a sauce pan and cook it on medium heat, adding the sugar and stirring. Once the sugar is dissolved and the milk is just boiling take it off the burner. Separate the rice into four bowls and pour a ladle of coconut milk over each. Top with the diced mango. This is definitely a dish even for people shy about making desserts, especially if they have a rice cooker. It doesn't particularly care if you cook the coconut milk too long or cut up the mango weirdly. You just need to trow everything together in a bowl and there is no need to mix, even. You can even substitute fruits like peaches or pineapple if you can't find a good mango. Seriously, make this. You won't regret it. I learned how to paint an animation cell at a short workshop taught at my university by Steve Bennett, formerly of Studio Ironcat. He would drive up to DC about once a year, teach us something, tell us stories, and then wolf down plates of sushi with us at the now defunct Appetizer Plus in Rosslyn, Virginia. Here is a picture of him with all of the ladies who attended the workshop that I took with my first digital camera. Good times. Okay, so the workshop was a (long) while ago, but I think I can recall the steps to painting a cell. First, I drew a figure on some clear .005 acetate with a permanent marker. The drawing was based on a doodle from my research notebook. The first things to be painted in a cell are any small white highlights or details, followed by small, colored details. The idea is to start with filling in the smaller areas of color first and then gradually move to painting the largest. I painted everything from the opposite side of my marker sketch. Sometimes permanent marker is less permanent than advertised, especially with wet paint. Next, I painted some the shadows in and some of the darker areas of color. The nice things about cells is that they can look uneven and crappy on the painted side, but look neat and clean when flipped over. If unwanted light shines through in certain spots when you hold it up there is no harm in doing a second coat. I used cheap opaque acrylic paints and they usually did the job in one coat. Finally, I painted in the larger details and when those were dry I painted in the biggest areas of color. I watched the first half of Wordplay yesterday, a documentary about the New York Times crossword puzzle, it's creators, and admirers. 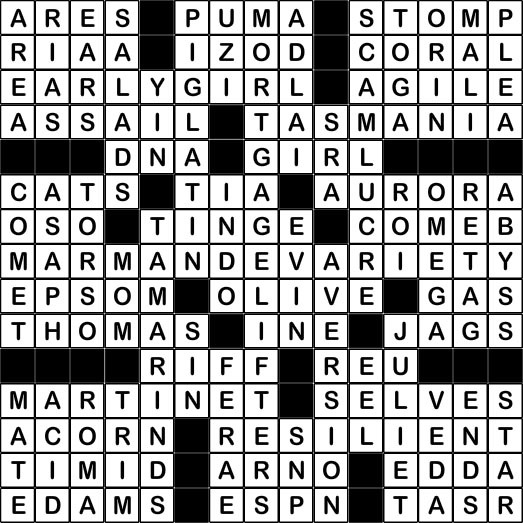 I had no idea that the daily puzzle is actually made not by one person, but lots of different people, nearly a hundred every year. They even showed one of the puzzle makers assembling a crossword, and it looked so easy. 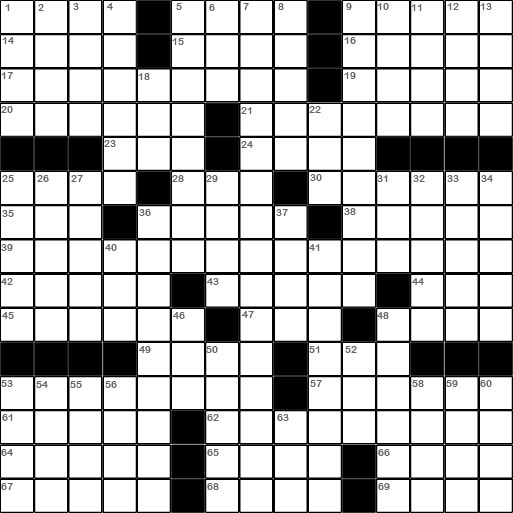 The puzzle maker used a grid on paper to plan his crossword. I, however, would probably erase through the paper from changing my mind so many times. Instead, I decided to make my own electronic, customizable grid that would suit my purpose better. I tried to make my grid as simple as possible. Just click on a square to enter a letter. Press the 'ENTER' key to turn a square black, Its mirror image will also be turned black in the grid style of the New York Times. Click again to make the black square go away. I think my next version will have automatic numbering and a customizable grid size. I've played with this thing for a few hours, and one thing is certain: making crossword puzzles is not easy at all. We're getting to know our animals a little better and what their needs are. The chickens, we've discovered, are pretty good about staying in the yard and not messing with the plants in the vegetable beds. We were originally thinking about setting up an open bottomed pen for them that we would move around the yard, but I'm starting to think that giving them the run of the whole place might not be a bad idea. That would probably also mean building a fixed coop that would be their permanent home base. They are pretty used to sleeping in the kitchen and walk in on their own during the evenings. It's adorable, but they're getting big enough to need a place of their own. Clark said that he would build one for me if I gave him plans. Well, he'll be getting a full architectural model. I used this guy as my chicken stand-in. It's a little over an inch tall which translates well to my 12:1 scale as the chickens will be a little over a foot tall when they are full grown. The bottom and top are two separate pieces so it's easier to see the ramp and the enclosed first story where the chickens will go for food and water. The top floor will have roosts and boxes for laying eggs. I used .005" plastic sheeting to make the pieces. I bought a 12 foot roll so it will be certain to resurface in a future project. The parts are held together with plain packing tape and I drew all of the illustrations on the pieces using permanent markers. Clark and I went to a John Vanderslice show at the Andy Warhol Museum today. The Warhol has occasional concerts, and its theater space is a wonderful, intimate place to hear live music. Plus, it's small enough that it's not necessary to blast the music, and so you don't need earplugs. If you've never heard John Vanderslice's music you should check out this, and this, and this. Clark and I went to see him perform with the Mountain Goats in Ohio, but due to a miscommunication we missed his set entirely. Still, he came out and sang one song with John Darnielle and I was really gobsmacked by how amazing his voice sounds in person. The tone and variation of notes he can hit are quite arresting, so I was really looking forward to hearing a whole concert of that today. I also love that the whole band sticks around to talk to audience members afterwords, too. I spent the whole concert drawing cartoons of everyone's instruments, so it was really wonderful to talk to each performer about their instruments and getting a closer look. John even taught Clark how to play the chords to Kookaburra so that he'll have something extra to practice during his lunchtimes. 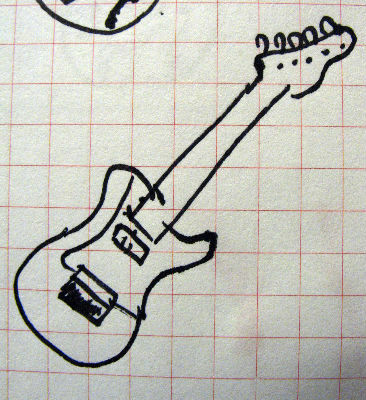 I wish I had written down the brand of John's electric guitar. He mentioned in between songs that the manufacturer adds faux aging to their guitars and rolled his eyes a little. John is also amusingly obsessed with this video of a concert from the Sasquatch festival. Jamie played the bass on a really sweet Rickenbacker. I will never be able to do the curves justice. 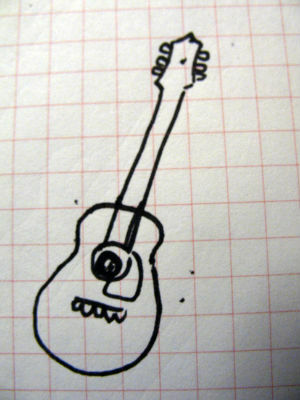 This is Sylvan's guitar. It had so many features that I had a tough time putting them together, even when I got a good look at it after the show, so I made an alternative, simplified sketch. He said that his instrument was a cheap one that cost about $600, but it sounded quite nice for the money. 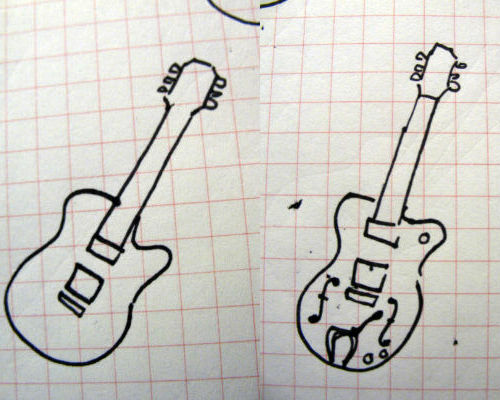 I couldn't get a good look at the drums or keyboards from where I was sitting, so their sketches were pretty incomplete. Lastly, here is a horse typing a novel. This one is in a bit late because it took me a while to finish and put together the support materials. My pattern for a half circle skirt is essentially two quarter circles stitched together. 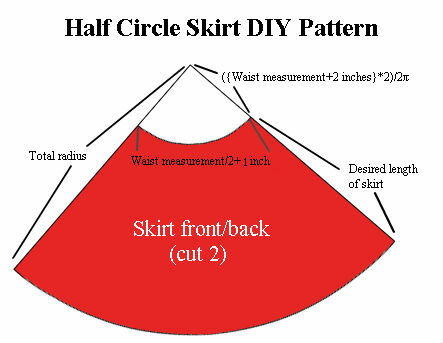 There is also another, smaller cutout of a quarter circle, indicated by the white wedge in the diagram above, that is removed the pattern piece to create the top waistline edge of the skirt. Your waist size will determine the size of the quarter circle you'll cut. The calculations for determining this are based on solving for the radius of a circle based on its circumference. In this case, the circumference will be twice your waist size, plus a little extra for ease and seam allowances. Why twice the size? 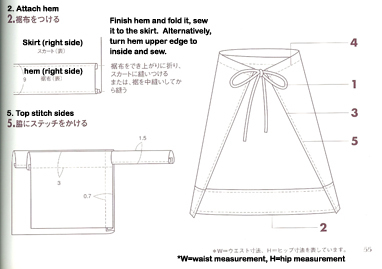 Well, you're making a half circle skirt, so really the waistline is only going to be 1/2 of the total circumference. We really want the radius of this big circle because it will tell us two things: how big to cut the pattern piece itself and how much to remove from the waistline. I got the size of my circumference by taking my waist size, adding one inch for seam allowances, and one more for ease (too tight = not comfy), and doubling that to get from a half circle to a full circle. I then solved for the radius and got a measurement of about 9.5 inches. The radius of the big quarter circle is based on two things: how long you want the skirt to be, and your waist measurement. I wanted my skirt to be 20 inches long, so I cut a quarter circle with a 29.5 inch radius. I used a piece of paper to gauge the 90 degree angle at the origin. Next, I cut a quarter circle with a 9.5 inch radius out of the top. I used double fold bias tape to finish off my skirt. If you're interested in hemming the top and bottom, just change the dimensions a little before cutting. Add an inch to the radius (for the bottom hem) and one inch less of the top wedge (for the top hem). It's berry season in the neighborhood and I want to stand under the trees and eat them ALL. Down the street, next to the neighborhood playground are a half-dozen mulberry trees, and one generous wild cherry tree. That's FREE FOOD just waiting for someone to take it and eat it, otherwise the ripe ones end up crushed on the sidewalk. It was raining this afternoon, but I spent about half an hour plucking berries and putting them in my basket/my mouth. I don't think many other people on my street pay much attention to them. MORE FOR ME! IT'S MINE! ALL MINE, I TELLS YA! The berries that made it home were combined with the day's strawberry harvest and ended up as the filling for shortbread tarts. That's all fruit that came from within three blocks of my house, FOR FREE. The filling is similar to my filling for strawberry rhubarb pie, but with a lot more sugar proportionally because the cherries were still a little bitter. Combine and set aside until you're ready to bake the crust. The recipe for the crust was inspired by a href="http://www.joyofbaking.com/BerryTart.html">this recipe<\a>, which is fantastic on its own, and doesn't call for the use of tart pans. I adjusted the ingredients to suit what I had in my cupboard and my own personal taste. Mix the dry ingredients and use a fork to cut in the butter until the mixture looks like graham cracker crumbles and there are no pieces of butter bigger than a pea remaining. Add the water slowly and while rolling up the dough into a ball. Separate into four pieces and refrigerate for 1 hour. Preheat the oven to 400 degrees. Roll the dough into 1/4 - 1/2 inch thick disks touching them as little as possible with your hands. Place each disk on a cookie sheet and add a few heaping tablespoons (or more) of berries into the center of the circle and fold up the sides (see picture above). Ideally, you would chill the cookie sheet in the fridge for a little while, but everyone wanted dessert ASAP so I popped mine right in the oven and baked for 25 minutes. They melted a little in the oven, but it was only a cosmetic flaw. Mmmm, so yummy. Plus the ingredients only cost a dollar or two when you factor in the free scavenged fruit. I am going to eat so much butter this summer! Saralinda purchased a sweet basket of fireworks to set off at the party last night. After we set everything off and woke up the neighbors we were left with two boxes of sparklers. Sparklers might not flare or make whizzing noises, but I like them quite a bit because they can be used to spell things. We settled on the "NO 'H' SARA" message because Saralinda has difficulties getting some of her relatives to spell her name correctly. As an Alison, a name with at least a dozen different spellings, I totally sympathize. I've made a few of my friends do this before, so most of them knew the sparkler writing drill. We lined everyone up and had them wave their sparklers in the shape of the letter they each were assigned while I took an 8 second exposure with my camera. The results weren't bad for a group of people who had been drinking for four hours or more. The term 'nama' (生), is used all the time in Japanese to describe foods that are fresh, uncooked, or should be eaten as soon as possible. For example, Nama beer is draft beer, Nama cream is whipped dairy cream, and Nama chocolate is chocolate ganache. The meaning of nama, though, means more than just being really fresh. It's something that tastes alive. After all, the 生 character is found in the verb 生きる, which means 'to live'. Today I made a simple salsa designed to capture that 'alive' taste in dip form. All that chopping takes a while, but once that's done you only need to combine the ingredients and you're finished. No cooking necessary for the nama. I drove my dip immediately to a nearby party so that everyone could have it as fresh as possible. I was very pleased that some friends pounced upon it immediately and ate most of it within an hour of its arrival. Oh, and I used three different kinds of tomatoes to add a little dimension to the overall taste: a vine tomato, a yellow tomato, and a red ugli tomato. I think using some nicer, less frequently purchased tomatoes added a little novelty in taste. I'm just one week sort of my goal of one month without buying snack foods, and more and more I've been thinking about sweet things. I've been baking a lot lately, but mostly for other people, so my sweet tooth has gone unsatisfied. It's a lot easier to make a polymer clay pie than to put together the real thing from scratch. Plus, I ♥ miniature food. Odds are that I'm going to make a pie sometime this week. We've only had our chickens and ducks for two weeks, but they've certainly grown and developed in that short amount of time. The chickens are really starting to develop personalities, especially now that they're starting to establish a pecking order. Every time we give them a little free range time there is always chaos for a few seconds while they flap around and harass each other. I named the chickens only a few days after their arrival. I'm a history fan, so each are named for Queens of France who had interesting second acts in life. One namesake became queen of England and then spent 16 years imprisoned by her husband, one ruled France as regent for her sons for nearly 30 years, and the last married in secret for love after her husband, King Louis XII, died. Out of the three, only one was born French, the other two were imports. Elanor (named for Elanor of Aquitaine) is the alpha chicken so far, so she usually gets her way. I can identify her by her size (she's definitely the biggest) or by the big patch of white feathers on her chest. Mary was named for Mary Tudor; both are redheads. 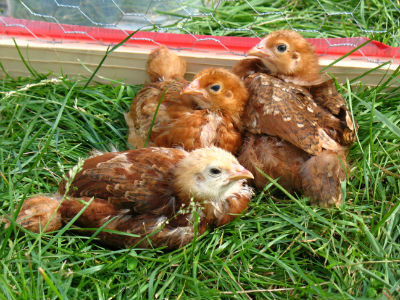 Mary is the smallest chicken and gets bullied by her sisters. They usually try to steal whatever she is eating, so sometimes I run interference to by Mary a few seconds to gobble down whatever she found. She's a little more curious than her sisters, and possibly a little smarter. She's the most cooperative one when it comes to taking pictures, good at posing and standing still, so she gets extra treats from me. Catherine, a blonde like her namesake, Catherine de' Medici, is the bounciest, most energetic of the three. I have to be careful when replacing food or water in the Chicken pen because she is always ready to escape. Catherine is just a little smaller than Elanor, so she is constantly challenging for dominance and the most prone to pick fights. She is going to be a challenge when she reaches adulthood. The Ducks remain nameless as Clark is still mulling over his choices. He calls them collectively his "Boys", though it is getting more evident by the day that they are both female. I really want to name one of them Houdini because she was an expert at escapes when we bought her, but that name was rejected. I am a terrible knitter. I'm slow and I lose track of stitches, so the most I could probably knit in one day would be a potholder. I have plenty of potholders. However, I do like making novelty knitting needles so other people can knit cool stuff. I will occasionally make my own needles, but I had a nice pair of #10 bamboo needles sitting around that were perfect for this project. I bought this set in Japan where nice sets of knitting needles are easy to find cheap. I've had this crazy fixation on donuts lately. I've been seeking out independent donut shops in Pittsburgh. The general consensus in the city is that Better-Maid Donuts is the best, but I prefer the yeasty, soft confections sold by Big Daddy's Donuts. Plus, Better-Maid is usually sold out by 9:00 am; Big Daddy's is open 24/7. Oh, and they have really good chili. Winner. I made some cake toppers to celebrate the miracle of donuts out of my stash of Fimo clay. I left them in the oven a little too long, so the surface developed a few cracks. Oops. There was some leftover wire from building the mobile coop for the ducks, namely a ~20 foot length coiled around the fencing to keep it from unraveling in the store. I have a few projects in mind that could use a pair of chicken feet, so I decided to reuse what I had on hand to make them. To make the feet I first twisted four 10-inch pieces of wire together. I left the ends free to form the three front toes and one back toe. I then took four 12 inch pieces of wire and wrapped them one at a time around the 'leg' and then around one toe each. I then cut the left over lengths of wire. I popped the two legs into a cup to see how well they could stand up on their own. The chickens were not impressed.